He is a versatile pianist, Vladimir Ashkenazy, and over the course of his long career he has put out recordings of almost every important work of the Romantic era, with a large proportion coming close to definitive status. He is, of course, a product of the Soviet system, were rigorous technique came first, and putting some real weight on the keys was de rigeur. But as his fine Chopin recordings, to give just one example, demonstrate, he is also a pianist with a sensitive side who can make melodies sing and can draw all sorts of elegant and subtle textures from the instrument. All of which makes him the ideal interpreter for Sibelius. His playing here does the composer's piano miniatures many favours. His playing style is always definite but never pedantic, and despite his vintage (I calculate he is 63), he still has the dexterity to pull off Sibelius' many fast accompaniment textures with grace and elegance. The programming here is interesting. Ashkenazy avoids the longer piano works and sticks to the miniatures, which on the whole are presented as complete opus sets. And as the opus numbers demonstrate, the works span the composer's life, or at least the part of it in which he was writing music. Despite that, the overriding impression is of stylistic continuity. Almost every work is based on a theme with strong melodic identity, and presented in a context of flowing and idiomatic accompanying figures. The sound quality is very good and is up to the usual high standards set by the Exton label. The SACD sound allows the timbral identity of the pianos to come through well, with all those higher harmonics really doing their job. Listeners who appreciate some atmosphere in their piano recordings may be disappointed, however. For one thing, there is no surround mix, it is CD and stereo SACD only. Also, the microphones are placed up close and there is very little ambient resonance. The main part of the recording was made in a concert hall, but you wouldn't know that to listen to it. I've no objections myself to this matter-of-fact style of audio presentation, although it is perhaps out of step with the almost impressionistic sound painting in many of the works. The one show-stopper on the disc is Sibelius' own transcription of his Valse Triste, which both opens and closes the programme. 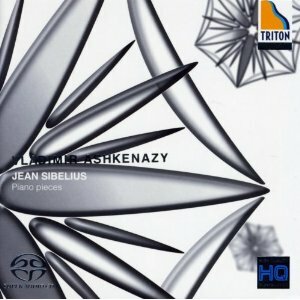 The last rendition is on Sibelius' own piano at his home, Ainola north of Helsinki. It's a gimmick really, and Ashkenazy is not the first to have paid homage to the composer in this way. It is a nice sign off though, and both the piano itself and the audio that the engineers manage in this less than ideal environment are better than you'd imagine. All round, this disc is an attractive proposition, with Exton demonstrating that top quality audio is not just a benefit in orchestral recordings, it has a great deal to offer the piano repertoire too.